The purpose of a company is to satisfy customer’s needs by making products and services. To do this, humans must to have knowledge. Knowledge comes from learning. However, learning alone is insufficient. Skills must be developed, which comes from practice. Practice is the result of a routine, or process, developed to make a product or service. As the process is practiced, errors are revealed that signal the need for improvement. Continuous learning and skill development that deepens results in experience. The result of lengthy experience is wisdom. What’s the purpose of leadership in a company? It is to lead people, guide individuals and groups, and determine organizational directions. A fundamental aspect of leadership is to influence employees, and most leaders do indeed influence people. The question is, what is the result of that influence? Employees can be influenced in ways that result in their development or it can result in their decline. 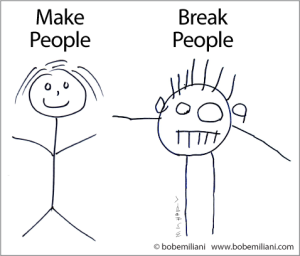 In other words, leaders can make people or they can break people. Unfortunately, most leaders don’t make people, they break people – even though it is clearly not their job to do so, and perhaps not even their intent. How are people put into decline and broken? By being told what to do and how to do it by one’s boss, which eliminates the need to think, be creative, and be innovative. Bosses also put employees into decline by blaming them for errors, and stoking fog-inducing organizational politics and its ever-present companion, political correctness. Employees are put into decline and broken when they are not allowed to see reality and respond to it. There is an obvious disconnect between the job of leadership, as commonly practiced, and its effect on employees. The consequences are bad for business in any way that one can think of. To make people, leaders must have knowledge. Knowledge comes from learning. However, learning alone is insufficient. Skills must be developed, which comes from practice. Practice is the result of a routine, or process. As the process is practiced, errors are revealed that should prompt the need for improvement – but it usually does not. Therefore, learning and skill development for leadership do not deepen over time, which greatly limits experience and results in little or no wisdom. Unfortunately, most leaders are leaders by virtue of their title, not as a result of their skills or capabilities. Leaders do work, and all work is made up of processes. So, just as anyone who does work is engaged in processes, so too are leaders engaged in processes. But, leaders don’t understand their work as processes, just as others do not. Instead, people, no matter what job they have, claim their work is not a process because it is creative, changes rapidly from one thing to the next, or is unpredictable. Their work is, in fact, a process, but they simply do not comprehend it that way. So people, even leaders, must learn: 1) to understand their work as processes, 2) that there is a need to improve their work processes, and 3) the methods for improving work processes. Being a leader carries with it responsibility for employee’s lives and livelihoods, as well as their mental and physical health. However, most leaders break people by making hundreds of errors in the leadership processes that they perform every day, negatively affecting both employee productivity and employee wellness. Leadership and the practice of management have been too slow in evolving over the last 100 years. There is demand for better leadership, especially from employees and investors, but it will not happen unless there is a breakthrough in leadership thinking and practice. My book, Speed Leadership: A New Way to Lead for Rapidly Changing Times, is that breakthrough. It teaches leaders how to make people from a scientific perspective, rather than an arts perspective, by improving leadership processes. I hope you will read it and learn how to improve leadership processes so that you can become better at making people, better at improving productivity, and better at improving the life and health of employees.